I'm on the roads and trails less these days (read: not at all). I have no interest in wind slapping my cheeks red, donning full-length tights, stocking up on ChapStick and staring at gray skies. No, I don't have fond memories of seasonal affective disorder. My bikes hang idle, one with a flat, another needing a chain adjustment and the third just wants some TLC. All are minor repairs and basic bike maintenance, but I'm on a lazy streak right now. Even commuting is too much effort. Thank God I'm still hauling it to the gym a few days a week and runnin' around the river on off days. Anything to keep me off the bike trainer. It truly is a month of fits and spurts. I have to take advantage of momentum. More often nowadays, I'm content with coasting. Winter is like that for most folks, right??? The other day I went great guns baking and cooking, making three consecutive things (a Manic Monday on a Tuesday) — two of which you'll get right now. 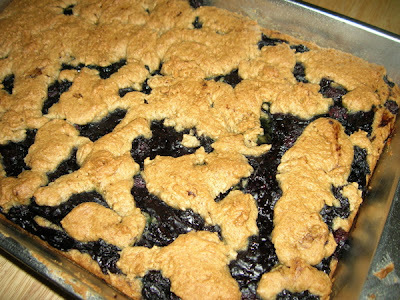 'Ere's another stab at the Blueberry Blondies. I made these for a coworker in exchange for the best homemade salsa I've had in awhile. I definitely came out the winner. The crusty covering is still not quite right, but I know what I now know the remedy. 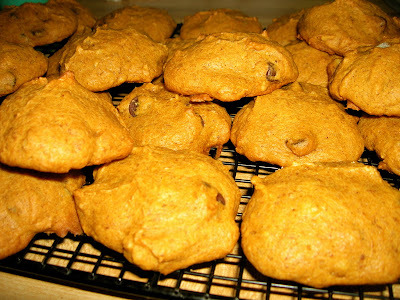 Also straight from the oven a week ago, something I ended up calling Pumpkin Chocolate Cakies. The problem with subbing flax seed for egg is the texture. A lot of cookies don't have a cookie chew. This is the case with these cookies, but I think they're none-the-less delicious. Recipe requests aplenty, and it really does make about 4 dozen, so have a army at your disposal (a hungry one at that, possibly fragile). So, yeah, it's a slower gear for the rest of the year. I apologize for what will no doubt be fewer posts until January.